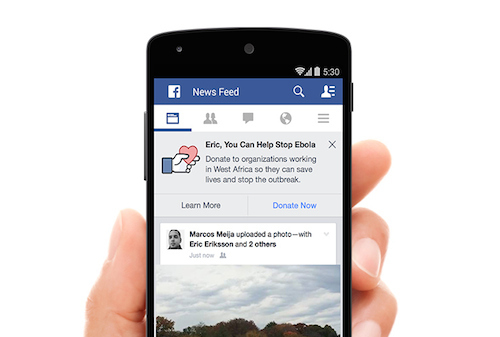 If you logged onto Facebook today, you might have noticed a new message at the top of your newsfeed asking you to make a donation to help stop Ebola. The campaign comes on the heels of Mark Zuckerberg’s personal $25 million donation to the CDC Foundation and is comprised of three components: a user donation solicitation asking users to donate to one of three charities; a collaboration with UNICEF to educate users on the signs and symptoms in targeted regions; and a collaboration with NetHope to provide emergency voice and data services to medical and aid workers in Guinea, Liberia and Sierra Leone. It’s not very often that Facebook throws its hat into the cause marketing ring, but this effort proves respectable and robust. Not only is Facebook using their greatest asset to raise funds, they’re collaborating with expert NGOs to both share information and leverage technology for the benefit of the effort. Having Mark Zuckerberg make a personal ask (and donation) also lends authenticity to this effort (see video below or here). Adding a visible tally of donations made might help increase the social proof element of this campaign. What’s your take on this new Facebook initiative? Weigh in with your comments below!